I’ve pinned out one half to show the patterning slightly better. As of 7th April 2015. 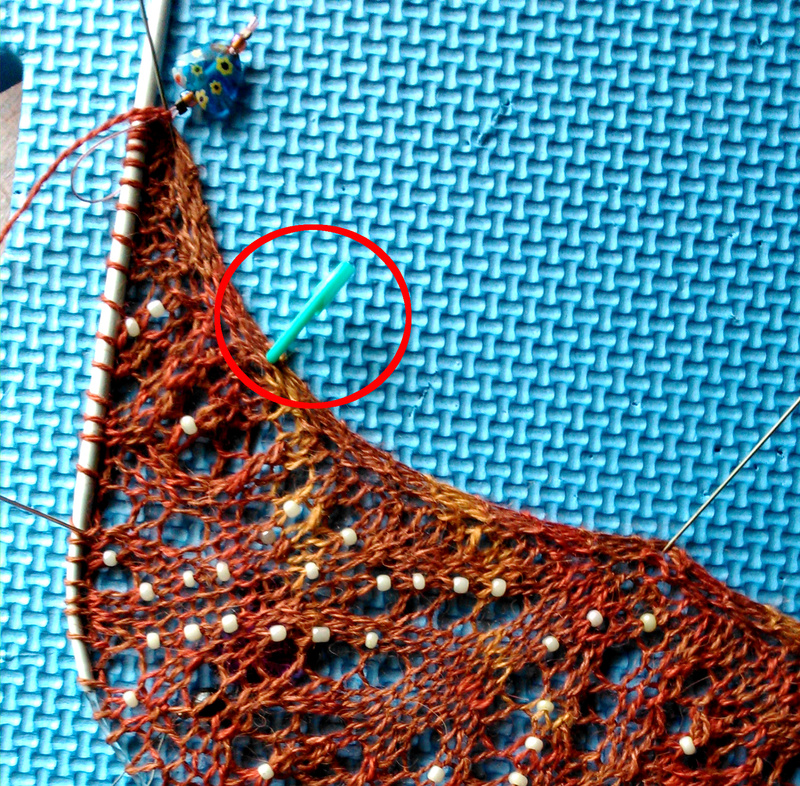 Stitch marker indicates where I started last week. I think 7 days is all I can manage on this (it takes a great deal of concentration and I’m increasing 6 sts every other row so it’s only going to get harder! ), so I’ve switched to another long-languishing UFO. Introducing the Advent Scarf/Stole from 2010! Oh look, it’s a big lump of lace! I’ve only got 4 “days” of pattern to go so I’m not quite sure why this stalled. I intend to press on and try and get it finished this week or next. So, how are your UFOs progressing? First, a quick refresh of the memory. Birch entrelac stole, almost at the half way point. I’m going to go ahead and add this to my WIP pile since I have now memorised the lace pattern (and almost memorised the side triangles). 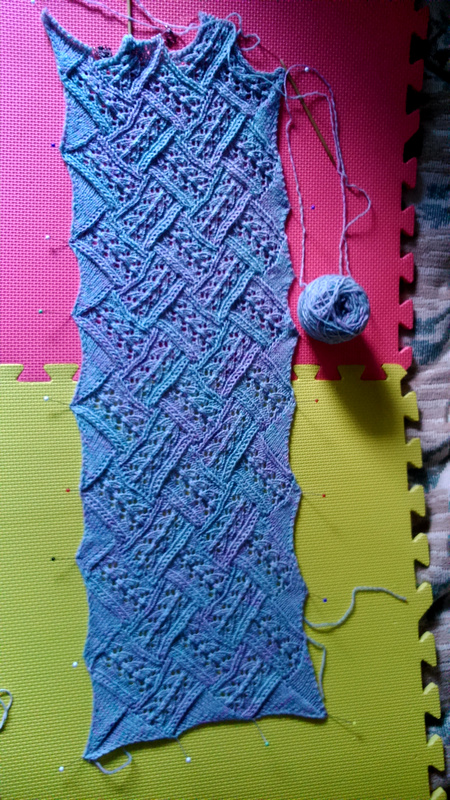 Iznik, I Heart You shawl status as of 31st March 2015. Terrible photo. Terrible photo, but you get the idea! 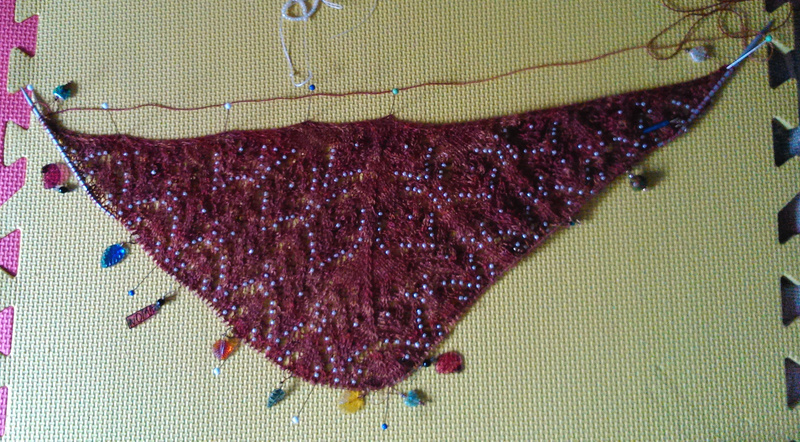 It’s lace knitting with beads so it is not TV-knitting. This is “Sitting bolt upright in a chair with good lighting and maybe a podcast on but absolutely no TV” knitting. Hence the UFO status! 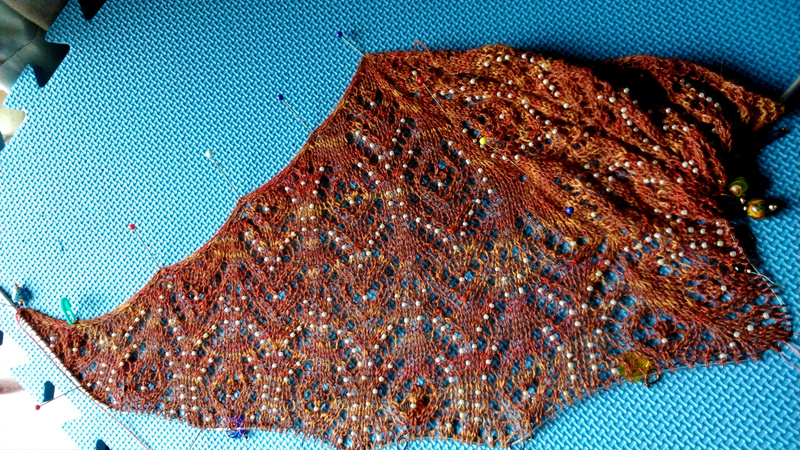 Well, now I have the lace pattern memorised (the side triangles trip me up sometimes) I’m fair motoring along. Progress as of Monday night. 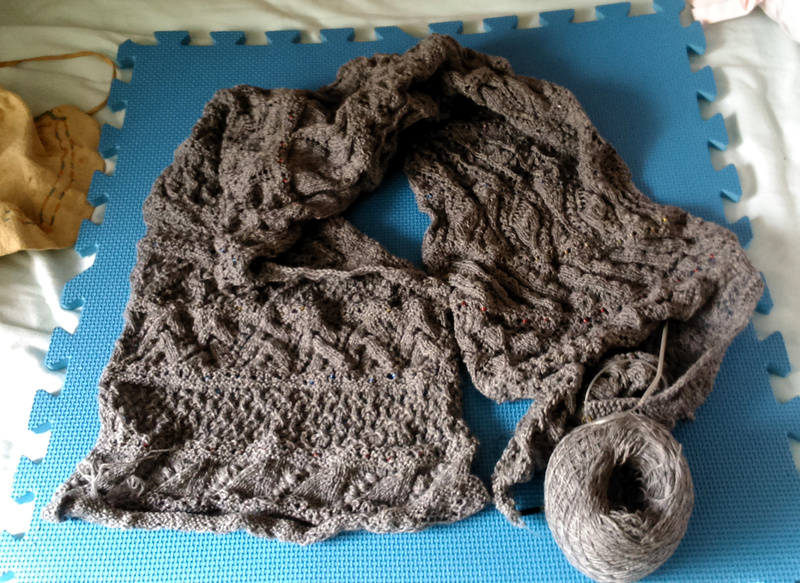 I’m going to keep going on this for another week, see if I can make it to the half way point (finishing the first ball of yarn). Stole progress from before UFO Tuesday was implemented. The Birch entrelac stole. 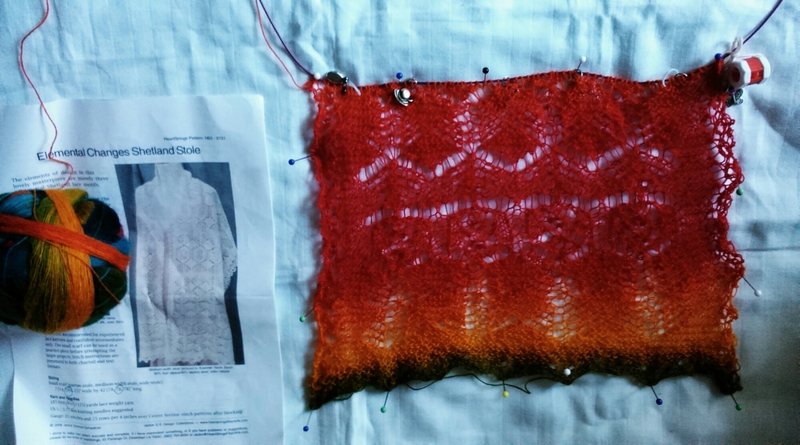 There wasn’t a Ravelry project page for this and the only reference I can find to it on my blog is this “Wall of Shame” post from February last year. Oh, well! Hurray! 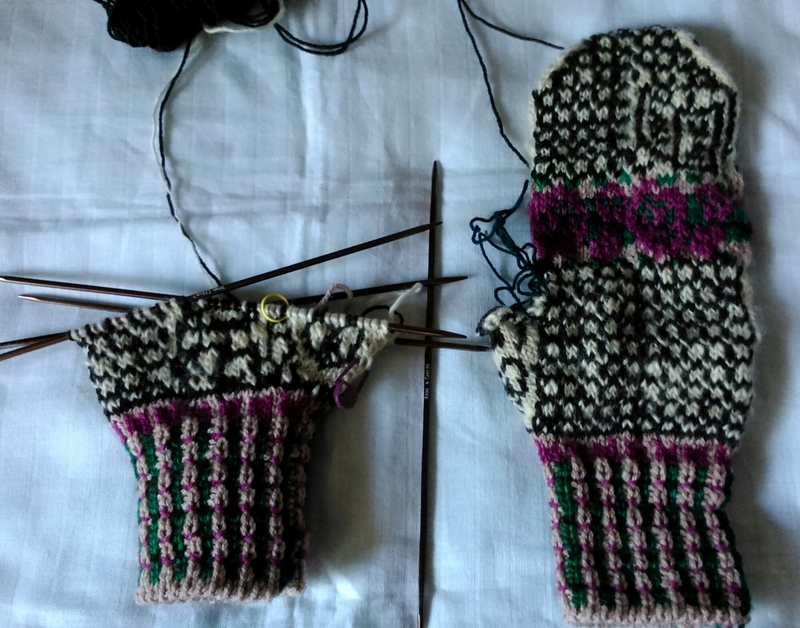 Actual, visible, progress on the Torirot/Secret Garden mittens. Not a great deal, I’ll grant you, but moving forward! These will go back in the box (it’s a literal box) to be worked on another week. The Rainbow Changes Shetland Stole. I know! I’d forgotten about it as well! 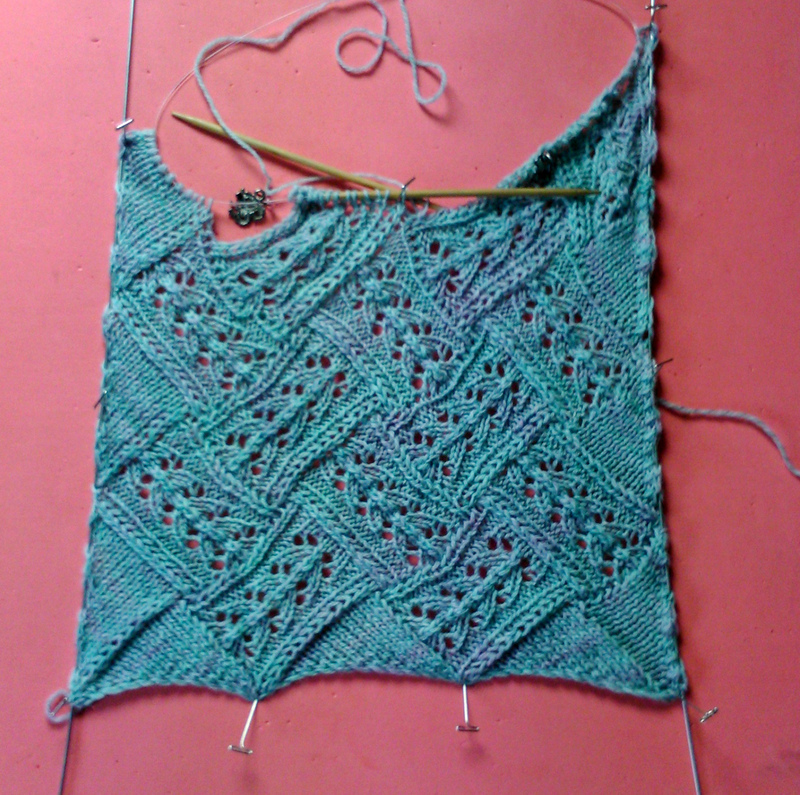 Now, as this is knitted lace (as opposed to lace knitting) it has yarn overs and decreases on both sides of the fabric. Yet another non-TV/high-concentration project.